Dr. Eugenie Brunner recently announced the release of her practice’s new, state-of-the-art website with innovative design elements, including an adaptable format and parallax scrolling. Princeton, NJ—In an effort to optimize user experience, provide more informative and compelling content, and appeal to a mobile-friendly market, Dr. Eugenie Brunner, a facial plastic surgeon in Princeton, recently upgraded her practice’s website. Utilizing popular design elements and an adaptable format, the new site offers visitors an easily navigable interface and aesthetically appealing layout in which to research information on a comprehensive selection of cosmetic facial procedures. In addition to the responsive design, which allows individuals to view the website from smartphones, laptops, tablets, and other mobile devices without having to scroll, pan, or zoom to view the entire screen, the updated site also features two leading trends in website design, parallax scrolling and a fixed image background. These details, in combination with the robust content, help to elevate the site beyond a traditional format and into an enlightening, user-friendly online destination. Patients seeking information about laser treatments, facial plastic surgery, and non-surgical cosmetic enhancement can now browse a clean navigation bar with drop down menus that lead to the photo gallery, office location, and much more. 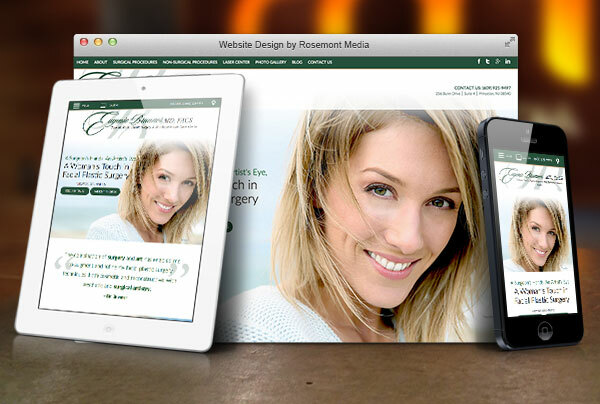 Dr. Brunner enlisted the help of Rosemont Media, a medical website design firm, to develop the customized site and update it with the latest medical SEO strategies, helping to expand the site’s visibility in the online marketplace. Ultimately, Dr. Brunner states that people are more frequently performing medical searches on the go, and she believes her modernized site offers current and prospective patients convenient access to the resources they are typically seeking. Certified by the American Board of Facial and Reconstructive Surgery and the American Board of Otolaryngology, Dr. Brunner received her undergraduate degree from Rutgers College and her medical degree from Robert Wood Johnson Medical School—The University of Medicine and Dentistry of New Jersey. After graduating medical school with honors, she completed additional training in otolaryngology (head and neck surgery) at New York University Medical Center. Additionally, she completed a fellowship at the University of Toronto in Advanced Cosmetic Facial Plastic Surgery. An active member of several esteemed medical associations, she is also a two-time recipient of the Patients’ Choice Award. Dr. Brunner is available for interview upon request.